Most people know that Sir Isaac Newton was a mathematician and natural philosopher and that he is credited with defining gravity in mathematical terms, but did you know he was also a fine editor? Ok, well, maybe not, but if you take a look at Newton’s Laws of Motion you might be surprised just how relevant they are to great storytelling. Newton’s first law describes the concept of inertia. It tells us that objects at rest (or in motion) will stay that way unless some outside force interferes. Many novels begin with a picture of what the main character’s life is like before the story proper begins. We get a sense of who they are and what they want out of life. Then, something happens to shake up their world, often referred to as an inciting incident. From the perspective of character growth, the character is stagnant and going nowhere, or stuck on a path, meandering inevitably toward some fate. This is inertia! The inciting incident is an external force that upsets the equilibrium of the character. Cool, right? There are a number of turning points that most stories share, like a midpoint and a black moment. What is happening to your characters in your stories at those points? Are the forces acting upon them sufficient to change the course they are on at that point in the story? Keep in mind that for storytelling purposes, the force acting on the character doesn’t have to be external. Maybe it’s a change in their thinking, as is often the case with black moments. Maybe it is them overcoming whatever their flaw happens to be and realizing they need to take a different course of action. One of my favorite lines ever comes from When Harry Met Sally, when Harry says, “…when you realize you want to spend the rest of your life with somebody, you want the rest of your life to start as soon as possible.” That realization was an extremely powerful force in the life of Harry Burns. The second law is probably the most difficult to relate to storytelling, but it’s worth doing because the idea, like the law itself, is quite powerful. Basically, you have to consider all forces acting on an object. From above, we know an object in motion tends to stay that way, but common sense dictates that if we shove a box across the floor it won’t keep going indefinitely. The reason it stops is because in addition to the shove we gave it, other forces are acting on the box, like gravity and friction. The same is true of your story. Why do so many books and movies have some form of time pressure, a proverbial ticking clock that defines a point at which something bad will happen? Why do books on storytelling say that the stakes should increase as the story progresses or the hazards a character faces should become more and more dire? Why do editors tell you to end a scene or chapter with a question of some kind? The answer is friction. Friction, in this context, is a tendency for your reader to stop turning to the next page and put the book down. Of course this tendency varies from reader to reader but I urge you to think of friction as a universal force that you can not be rid of. What you can do is continually propel your story forward with enough force, enough momentum, to overcome that friction so your story, and your reader, don’t come to a grinding halt. Use ticking clocks if appropriate. Increase stakes. Cut back things that don’t seem important and are bogging down the momentum. And once something becomes inevitable in your story, like a character makes an important decision, drive toward it and don’t become sidetracked. Harry wants the rest of his life to start as soon as possible, not five chapters from now (unless five chapters from now is as soon as possible and he’s fighting desperately for that outcome the whole way). Everyone has heard this one in some form, such as, “For every action, there is an equal and opposite reaction.” This relates back to the blog post I inflicted upon you last month where I wrote about doing harm to characters. For our purposes, this law refers to balance between good and evil in a story, between dire perils and daring escapes, between the relative strength of protagonist and antagonist, obstacle and happy ending. As I said in the comments section of last month’s post, if you have a weak antagonist, there isn’t enough for the protagonist to push back against, which can create big problems with suspension of disbelief and leave your story feeling flat. If you have a fantasy story where the protagonist transforms into the avatar of a god at the end to smite the bad guys, the character had better have suffered tremendously at the hands of the antagonist along the way and that antagonist had better do a better job of embodying evil than Snidely Whiplash or Ultron (seriously, what a waste of James Spader’s talents, “No strings” commercial aside). Not every story has to be galaxy-spanning, either. This applies to “small” stories too. I think it’s fair to say that the ending of When Harry Met Sally, that two people who are so different should fall in love, is improbable. But look at how much they have to go through to make it to that point, all the challenges they have to navigate. They face incredible obstacles before finding happiness together, and that’s what makes it work when they finally do. Maybe Newton wasn’t an editor, but I do find it fascinating that the ways in which we define the physical world can have such interesting parallels to the worlds we create inside our own minds. Even if you, like a certain wise-cracking rabbit, “never studied law,” I hope Newton’s Laws give you something to ponder as you write or revise your next project and you don’t leave your reader hanging. I love this analogy. I realized recently that along the vast MIDDLE of the story, my MC was less interesting than the characters revolving around her, so I guess that could be called inertia, with her just kind of moseying along while the others were busy doing their respective things. 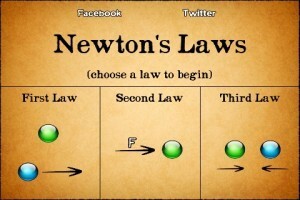 I may print that Newton graphic and hang it over my desk as a reminder to make sure the friction keeps going. Thanks, Susan. I’m so glad you got something out of it. I certainly had fun writing it. Keeping a story moving is a common struggle for a lot of authors, so you aren’t alone, there. I quite like the idea that as authors and editors we have to actively work to keep the reader moving along and not just take for granted they will keep reading.